The sights and sounds at Canto Del Mar (Song of the Sea) will leave you awestruck. Canto Del Mar is comprised of terraced villas set on the lush hillside, against a backdrop of mountains in every shade of green. Alluring sights and sounds of the ocean are visible from almost any room. Dominical, an easy-going beach town on the southern Pacific Coast, it’s a favorite destination for both surfers and those visitors seeking an authentic Costa Rican experience. The sights and sounds at Canto Del Mar will leave you awestruck. Canto Del Mar is comprised of terraced villas set on the lush hillside, against a backdrop of mountains in every shade of green. Walk to the beach or hike in the jungle right from your front door, where it’s not unusual to encounter monkeys, sloths and other Costa Rican wildlife. Situated where the mountainous rainforest meets the ocean, creating an array of adventures and activities. This two-bedroom, two and one half bath villa overlooks the Pacific Ocean at a unique location where you can watch the surf all day long. Beaches are ideal for both surfing and relaxing, while jungle hikes, canopy tours, wildlife refuges, horseback riding, snorkeling, sport fishing and everything else you’d want to experience in Costa Rica are all right here. The sights and sounds our brand new Canto Del Mar (Song of the Sea) villa will leave you awestruck. This small vacation community is comprised of terraced villas set on the lush hillside, with a backdrop of mountains in every shade of green. Alluring sights and sounds of the ocean are visible from almost any room, in this two bedroom, two story freestanding villa. Walk to the beach or hike in the jungle right from your front door, where it’s not unusual to encounter monkeys, sloths and other Costa Rican wildlife. How to get to Dominical: Two commuter airlines, Nature Air and Sansa, leave from San Jose, Liberia and other towns in Costa Rica to either the Quepos Airport which is about 1 hour North of Dominical or to Palmar Sur which is about 40 minutes South of Dominical. The drive from San Jose is 3 ½ to 4 hours drive depending on the route. The one route goes along the cost and the other is more of a mountain trip. Its 3 ½ hours if taking the mountain road through San Isidro de General. The coastal route through Jaco and Quepos is 4 hours. Please feel free to email me or call for more information. Also please take a look at my site dedicated to the Villa and let me know if you have any further questions as I will be glad to answer any questions or help out in any way possible. Great place with a gorgeous view! We loved staying in this villa with an amazing view of the Pacific! We had everything we needed and loved watching the monkeys and birds from the balconies. Such a treat to stay here and wish we could have stayed longer! Just as advertised, spectacular views. Immaculately clean and very well maintained. Great support for any issues we encountered. Really enjoyed seeing the wildlife from our patio. We saw monkeys, a sloth, toucans and Blue morph butterflies in the six weeks we were there. My husband and I walk everywhere and I must say the road to the villa was a challenging hill but we viewed it as good exercise. Tiny bit disappointed in the traffic noise from the highway. Very impressed with this property. Views were amazing. Overall, it was clean and very peaceful. AC and internet worked very well. Having a full kitchen to make breakfast every morning was a huge plus. Washer/dryer was also a great feature. Very small but important: there was no coffee filters for the coffee maker, so we had to buy our own. I do know this brand of coffee maker comes with a reusable coffee filter, so investing in that would be great. Location was perfect.....we were easily able to drive to Manual Antonio (35-40 minutes) and Uvita (15 minutes) for our excursions. Locals in Dominical were friendly and helpful. Highly recommend this property. 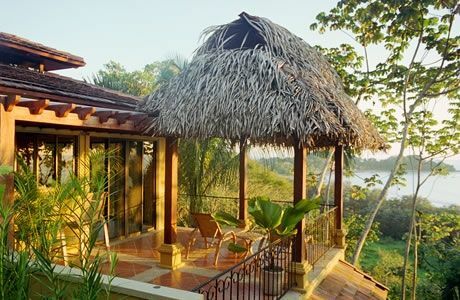 Hopefully, on my return trip to Costa Rica in the future, I can take advantage of this beautiful property. Everything was as promised and perfect. Family of four with 2 dogs and we loved this place. Plenty of space for our family and dogs and the pictures do the place justice. You are looking at the ocean from every room. You're not beach front but it's just across the street. There's also an amazing swimming hole with a small waterfall just up the road, it even has a tarzan swing for your kids. Unpaved dirt road getting onto the gated property, 4x4 would be best for the rainy days. Gavin was very prompt in all communications as well. Would highly recommend this place and would definitely stay here again. Glad you enjoyed your stay. We are actually in the process of regrading the roads this month after the rainy season. Hope to see you back one day. Weekly and monthly discount rates available. Security deposit required, refundable after stay Cleaning services available on request Peak Season .. Dec-Apr .. $150/night Off Season ... May-Nov .. $120/night Weekly and monthly rates available.